This entry was posted in Book Memes, WWW Wednesdays and tagged a darker shade of magic, a gathering of shadows, book memes, colleen hoover, daughter of smoke and bone, kristin hannah, laini taylor, maureen johnson, maybe someday, michael thomas ford, robert bryndza, robyn schneider, sharon m. draper, suicide notes, the beginning of everything, the girl in the ice, the name of the star, the nightingale, v.e. schwab, www wednesdays by Yvo. Bookmark the permalink. I know what you mean about The Girl In The Ice but it didn’t bother me so much, it seems to be the norm! As is lead female detectives who are amazing at the day job but can’t make their personal lives work. I guess you’re right; most female detectives seem to have to be ‘bitchy’ and have a complicated personal life to become good at their job… It’s not necessarily a bad thing, but it did stand out a bit too much in The Girl In The Ice for me. The plot is excellent though; I didn’t see it coming who was the murderer until the very end! Yeah the ending did come out of nowhere which was great. There were so many suspects though at least you could try and have a calculated guess.. Very true! I actually thought the father might have done it at one point haha, although Igor was the best candidate throughout the book… I always like a surprising ending though. Good call reading the Shades of Magic books before Smoke and Bone because they’re much better! I found Smoke and Bone disappointing because until about two thirds of the way through it was all kinds of awesome… and then something occurs and it all went downhill for me 😦 Hopefully the same won’t happen for you and you’ll love it. I managed to finish it today and I still think the characters and constant bitching put a slight damper on an otherwise excellent read… The plot was really good and the plot twists even better! I really want to read The Girl in the Ice though dissapointed to see that the characters are not all that. I will wait to read your full review though. Crossing my fingers too that Maybe Someday will turn out to be as good as November 9. Enjoy your books. The characters might not be all that likeable, but the plot itself is really good and mostly makes up for it. I’ve decided to start Maybe Someday next now I’ve finished The Girl In The Ice and the first pages sound really promising! Oh you are already done with The Girl in the Ice? I can’t wait to read your review on it. I hope you enjoy Maybe Someday. I managed to finish it yesterday yes… Like I said, the plot is really well done and the plot twists definitely surprising, so that does kind of make up for the ‘bitchy’ characters. And I’m loving Maybe Someday so far! I got impatient waiting for library’s on-order copies of A Gathering of Shadows to finally arrive, so I’ve bought myself a copy, too. I’ve got a few things to finish before I get to it, though. Good luck finishing the review of A Darker Shade… I’m currently trying to write a review that isn’t just fangirling as well, so I feel your pain. Haha I can definitely understand why the wait would have felt too long… I really want to start reading A Gathering Of Shadows as well; hopefully I will be able to write down something somewhat coherent about A Darker Shade Of Magic tonight. 😉 So far it’s mostly fangirling, saying the book is brilliant and to just read it haha. Good luck to you as well! I will definitely try to pick those up next! Daughter Of Smoke And Bone is 100% sure my next fantasy read after finishing A Gathering Of Shadows…. That’s too bad about The Girl in the Ice. I hate when a good portion of the book is characters ‘bitching’ at/to each other. It ruins the story for me. I’m glad you enjoyed Out of My Mind! I love that one! I’m definitely excited to read A Darker Shade of Magic for all of the reasons you mentioned above. In my opinion, Maybe Someday was definitely better than November 9! I loved it. I hope you’ll enjoy it as much as everyone did (including me now! 😉 ), it’s SUCH a good read! I’ve just started Maybe Someday and the first two chapters look definitely promising. Happy reading! Being at Disneyland would definitely help with the atmosphere! I really liked her other novel, but The Beginning Of Everything just was a tad too cliche for me… The fact that I didn’t like the characters didn’t really help either. I’m glad you enjoyed it though! Interesting to read about The Beginning of Everything. I was wondering whether to check it out. If I have to pick one, I would definitely recommend her other novel Extraordinary Means over The Beginning Of Everything. The plot is a lot more original and I liked the characters a lot better. 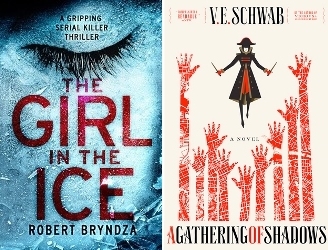 I totally agree; when either the plot/plot twists or characters don’t work it can definitely ruin a story for me… I still enjoyed reading The Girl In The Ice and the plot was excellent, but the bitchy characters did slightly ruin it for me. The Beginning Of Everything just was way too cheesy/cliche for me and I didn’t like the characters either… Her other novel was way better. A Darker Shade Of Magic is SUCH a good book though! I’m glad you liked A Darker Shade of Magic so much. I really liked it too but haven’t been able to find the sequel available yet. Soon I hope. Happy reading and thanks for participating in WWW Wednesday! I hope you will be able to find the sequel soon! I finally managed to get a review together so I will continue reading the sequel tomorrow. Happy reading and thanks for hosting! I’m so glad you enjoyed A Darker Shade of Magic. It’s definitely been one of my favorite new reads this year. Good to hear you enjoyed it as well! Such a brilliant book; I already know it will appear on my list of 2016 favorites. Happy reading!